Editor’s note: Updated June 2018. If there’s one thing we can take away from Indiana Jones’ third adventure, it’s that looks can be deceiving and maybe the most obvious choice isn’t always the right one. Wealthy American industrialist and Nazi sympathizer Walter Donovan learned this the hard way when – SPOILER ALERT! – he drank from the wrong cup at the Temple of the Sun, mistaking it for the fabled Holy Grail. Now, the stakes of picking a content management system aren’t quite that high (although some marketers may disagree), but the wrong CMS could severely impede your content marketing strategies. A buggy mess of a backend could be a real nightmare to wade through, and poorly implemented frontend features may not place your content in the best possible light for consumption. If you want to hear a spooky CMS tale that’s guaranteed to keep you up at night, take a gander at this. The TL;DR of it is a company takes great pains to deploy one of the most expensive CMS platforms available only to realize at launch that it’s too resource-intensive for their hardware and the end result is too complex for normal users to navigate with any degree of competence. Whatever CMS you wind up choosing, know from the outset that you’re in it for the long haul. Your site will be running off of that platform for years to come, and there’s no room for buyer’s remorse if you later decide that it lacks the functionality and features you absolutely need. Indeed, making a CMS switch will require a lot of money and manpower, not to mention a whole bunch of blood, sweat and tears. It can get messy, is what we’re trying to say. Your entire website will essentially need to be rebuilt from scratch, so if you go this route, you can kiss your social life goodbye as you spend countless nights working with developers on configuring, staging and releasing your new platform. The best course of action is to do your due diligence up front and pick the right CMS for your content marketing needs from the get-go. It’ll save you a lot of heartache in the long run. So, what’s the best CMS for content marketers? Truthfully, each option has its own pluses and minuses, but depending on the specific capabilities you’re looking for and the functionality you need to execute on your marketing goals, you’ll find one that’s just right. 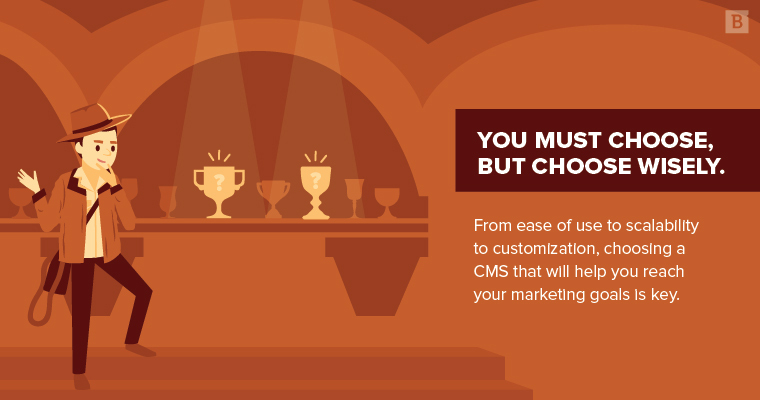 Before we dive into the pros and cons of the premier options available, let’s review the criteria you should use to assess CMS performance and capability. If your average end user finds it difficult to carry out basic tasks with your CMS, you’re going to have problems. Your tech guys are going to be saddled with more help tickets and requests than they’ll know what to do with, and some users may decide that the amount of effort and know-how needed to make even simplest of changes simply isn’t worth it. In particular, you want to be sure every stakeholder will be able to grasp the finer points of the platform’s WYSIWYG editor and inline editing tools. For a CMS to succeed, it needs to be approachable for anyone involved in your ongoing content marketing efforts. Never, ever choose a CMS platform based solely on your current content needs. You need to be planning for the future, and it’s better to assume your content volume will increase over the next couple of years. While we’re staying positive here, let’s also go ahead and predict that your painstakingly crafted content is going to find a huge audience in the near future. Your CMS needs to be able to handle traffic spikes and continue chugging along regardless of how much strain is placed on it. “Plug and play” isn’t really a thing in the CMS world, but that doesn’t stop marketers from looking far and wide for a dead-simple platform that just works. The truth is, some complexity is good – and a hefty amount of customization is even better. Tech teams should have the ability to tweak workflows and configurations as needed to improve CMS performance and gear it to an organization’s specific needs. Regardless if the processes you have in place to publish, edit and distribute content are working OK, there could always be a better way to do things. By giving yourself the flexibility to make changes to streamline workflows and customize your platform according to what you actually need it to do, your CMS – and your usage of it – will constantly improve. Ideally, your CMS platform should facilitate search engine optimization efforts by including extensions, plugins and tools that improve your site’s ranking. It would be foolish to assume that all do so in equal measure, however. Some CMS solutions come equipped with SEO-boosting capabilities straight out of the box; others require a little finessing to get the most SEO value out of them. You have to ask yourself: How much work do you want to put into your CMS platform just to hit SEO best practices? WordPress has laid the foundation for every two-bit, no-name blogger out there, and for good reason – it’s a breeze to set up and use. What it lacks in complexity, it makes up for with a pretty wide range of available plugins to build out functionality and add new features. WordPress may be the easiest, most intuitive CMS platform out there, and thanks to its widespread popularity, your non-technical users are more likely to be familiar with its interface. If you don’t need a lot of bells and whistles with your CMS, and just want a platform that’s primed for SEO right away, WordPress may be exactly what you’re looking for. WordPress’s capabilities are pretty modest right out of the box, but developers can quickly build upon that framework with its extensive plugin options. There are some drawbacks to the platform, however. Its search functions, for instance, are fairly rudimentary compared with some more sophisticated CMS platforms. Although search can be built out to support much larger sites, it’ll take a lot of legwork to get there. Those aforementioned plugins really shine, helping expand WordPress’s feature set beyond its baseline functionality. However, there is a limit to what can be done, and organizations that have in-house technical expertise will likely find that more sophisticated platforms offer a much higher ceiling for customization. WordPress falls short of getting an “A” here because, truthfully, its SEO features aren’t all that great out of the box. However, its rich development community once again swoops in to save the day. There are tons of WordPress plugins that build out its SEO capabilities, incorporating some of the best SEO solutions available, including SEMrush and Yoast SEO. The sheer scale of SEO-based plugins supported by WordPress is unmatched by any other platform. Now if they could just bake those into the baseline platform. While not quite as user-friendly as WordPress, Hubspot is easier to pick up and grasp than some of the more complex options out there. It also offers support services to answer any questions and provide guidance whenever needed. There’s a tradeoff in cost, however, as the upfront investment can be pretty high compared with WordPress. The beauty of Hubspot is that because it’s a hosted platform, it can support an incredible number of users. Hubspot has been specifically designed to handle millions of requests, enabling organizations to scale-up whenever needed without skipping a beat. Hubspot users are typically attracted to its “total package” messaging. You don’t need to hunt around looking for and installing plugins to expand its capabilities – it’s all right there out of the box. The downside to that is they can quickly be confined to that Hubspot environment. Relying on the tools and features that are made available. Any Hubspot expert will be able to work around these limitations and break out of the platform’s innate confinement, but it will likely be a struggle to do so. Squarespace is the go-to platform for non-technical users. What it lacks in features and scalability, it somewhat makes up for with its dead-simple interface and setup. The appeal of being able to do everything yourself without having to pay a specialist can be pretty tempting for a lot of burgeoning entrepreneurs out there. Squarespace is designed for your average Joe to get a meat-and-potatoes website up and running. With a little effort, just about anyone can get Squarespace to do what they need. There’s also a support system in place to help users overcome any obstacles that get in their way. Although Squarespace is often viewed as a starter CMS for one-man operations, there’s more horsepower here than you might expect. Because it’s a hosted platform, it can support a lot of users at once. It may not have a lengthy feature list, but Squarespace can hold its own when it comes to multi-user capabilities. Although there are some tools available to tweak Squarespace’s functionality, it’s not really designed for endless customization. Anyone looking for flexibility will likely be disappointed with this option. Despite the average grade here, Squarespace isn’t all that bad at SEO. Newcomers can benefit from some of the baked-in features such as sitemaps, as well as the platform’s support for responsive design. However, those who are looking for more sophisticated capabilities will undoubtedly find Squarespace a bit lacking in that department. Because it’s self-hosted, you really can’t apply the kind of advanced customization required to maximize your CMS’s SEO value. Built with a more technical audience in mind, Drupal is pretty intimidating to just about everyone other than developers. Its scalability and extensive list of features make it a very promising platform for those who know how to get the most out of it, though. Drupal is very scalable out of the box, and experienced developers will be able to expand its functionality to ably support new features and an increasing number of users. It may be difficult for even the technically minded to get familiar with Drupal, but once they do, the world’s their oyster. For instance, if you’re building a site for a global audience, you’ll need multi-language support. Some heavy hitters (*cough* WordPress *cough*) don’t natively support such capabilities, but Drupal does. And your team can build upon those features to reach whatever market you like. Drupal provides developers with the tools needed to do anything they want – it’s just a matter of getting over that high learning curve. Designed with SEO in mind, Drupal may be the best content management system out there when it comes to this category. Its baseline capabilities are already search engine-friendly, but its massive number of themes and plugins only further build out its SEO capabilities. The caveat, as always, with Drupal is that you need an experienced development team to capitalize on those features. Like Drupal, Joomla is an open source CMS platform that offers endless customization opportunities for those with the requisite programming chops. If you’re looking for a content management system software that’s a step above the barebones WordPress, but not quite as involved or complex as Drupal, Joomla could hit that sweet spot. Joomla programming isn’t on the same level of difficulty as Drupal, but it’s not exactly easy, either. Without some semblance of technical skills, you’ll never be able to wring the full value out of this platform. Joomla’s collection of available components and modules makes life a little easier on your tech team, but by no means will it be a walk in the park to tackle more complex projects. Solid “B” territory here. Joomla is no slouch when it comes to scalability, coming out ahead of WordPress in this department, thanks to its baked-in components and ability to support large, complex deployments. For that reason, Joomla is very popular with e-commerce merchants who have outgrown their initial, WordPress-based systems. With a host of e-commerce extensions like shopping carts and integration capabilities, Joomla is the platform of choice for merchants looking to kick things up a notch. For those same reasons, it’s a great option for social media purposes, coming equipped with a bunch of useful tools. 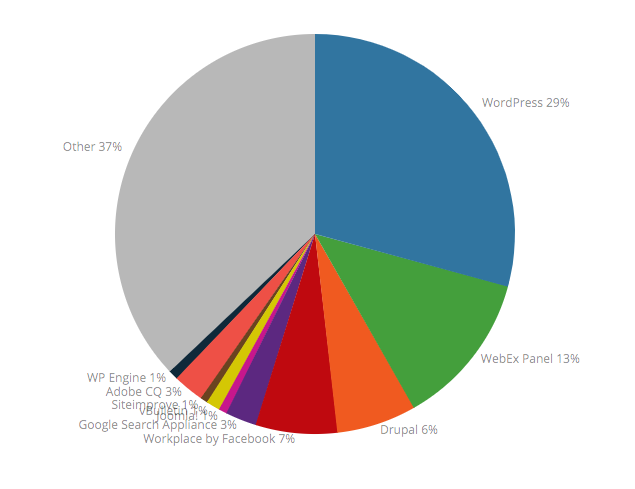 All in all, it sits nicely in between WordPress and Drupal on the scalability scale. Do you see a trend forming here? It would be a bit unfair to say that Joomla is a “Jack of all trades, master of none,” but … it’s hard to deny that from a technical standpoint, Joomla is kind of Drupal-light. Unlike WordPress, though, it doesn’t rely on its user community to create plugins and build out its capabilities. The tools are all right there, but the customization options come up just short of what a highly skilled Drupal team can accomplish. The “B’s” have it: Yet again, Joomla is good, but not great. Development teams will need to install some key plugins and change configurations to really gear Joomla for SEO purposes. Once that’s done, users can take advantage of some pretty powerful tools, though. For instance, the Sh404SEF plugin can remove duplicate URLs and address 404 redirects without lifting a finger. Not too shabby. The last option is to forgo the various options out there and simply build and host your own proprietary CMS software. The upshot is you have total control of the final product and can create the CMS solution of your dreams. For instance, say you want a CMS designed around a flat-file database to clamp down on potential security exploits and make it easier to scale up. You can go ahead and build such a content management system to your exact specifications. The downside is you need a lot of internal support to get the job done, and that will cost you a pretty penny. Furthermore, you’ll have to do a lot more legwork to integrate your custom-built solution with other important systems like digital asset management, document management or web content management platforms. It’s hard to assign specific grades to the usability, scalability, customization and SEO-readiness offered by this approach because it really comes down to individual circumstances. That being said, there’s really no reason to reinvent the wheel when there are plenty of fine choices available that won’t cost nearly as much or give you quite as many headaches. So, what’s the best CMS? The answer is … there isn’t one. It’s all subjective, really, determined by how familiar your dev team is with each platform. An expert Drupal user won’t be deterred by its steep learning curve, but that same individual may not be as comfortable working with the ostensibly more user-friendly Hubspot. 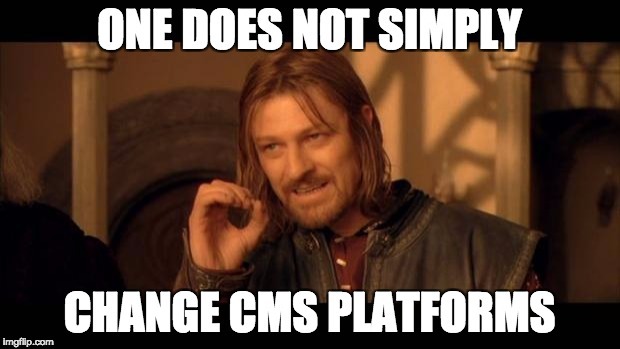 There’s a reason every CMS platform listed here is widely used: They all offer the core functionalities you need from a content management system, even if it takes a little configuration to get everything you want. It’s not like your team won’t be able to integrate a comment section powered by Disqus if that’s a feature you’re really gunning for. We’ll say this, though. Because the best content management system is the one your developers have the most expertise in, it doesn’t hurt to strongly consider going with the most popular platform available. At the moment, 29 percent of the websites out there use WordPress. In comparison, only 7 percent of websites use Drupal. Odds are you’re more likely to find WordPress experts available for assistance than other platforms, but exact circumstances will be different for everyone. Ultimately, any CMS platform will be able to meet your needs, just as long as you have a knowledgeable team working on it. Match the right team with the right solution, and success is all but guaranteed.